I suppose it's true in every industry that there is still some sort of glass ceiling, some limitation on women's contributions, or unequal pay for equal work. Among writers, this can be hard to gauge. As independent workers, we exist outside of many of the structures that would allow us to study and know about these discrepancies, plus the quality of our work is highly subjective, so it's often hard to compare ourselves to others--men or women. I was saddened recently to learn that there are many powerful people in publishing who seem to believe--consciously or subconsciously--that women's writing is inherently weaker than men's. To the point where women writers have been excluded from some very important exposure opportunities. A non-profit called VIDA: Women in the Literary Arts has been studying women's representation in major literary venues, like The Atlantic, The New Yorker, Harper's, and The New Republic. VIDA volunteers counted how many women were included in the 2010 issues of these publications, either as contributors, reviewers or review subjects. Literally, counted. The statistics The Count generated might surprise you. They surprised me. In the majority of these publications, women's representation was down around 25%- 30%. REALLY? Sure, we've known anecdotally for some time that women get published less frequently than men, and that we get less attention for our work than do men. But having the facts and figures to back it up really makes the knowledge hit home. Hopefully, it also means we can begin taking steps toward greater equality of representation. Starting now. 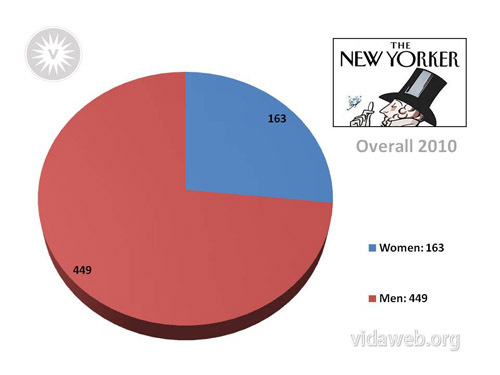 Do you think women are well-represented in print media? Any favorite publications you know that have a better ratio of representation?